One of the earliest major British landscape painters, whose works combine a mood of classical serenity with picturesque effects. In 1729 Wilson studied portraiture with Thomas Wright in London and after about 1735 worked on his own in this genre. 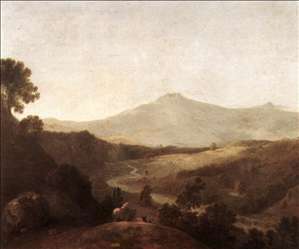 From 1746 his work shows a growing interest in landscape that, soon after his arrival in Italy late in 1750, became almost exclusive. Staying at first in Venice, he met the landscape painter Francesco Zuccarelli. Early in 1752 he went to Rome and became part of an art circle that included the painters Joseph Vernet and Anton Raphael Mengs. He remained in Rome until 1757, working mostly for aristocratic English tourists. 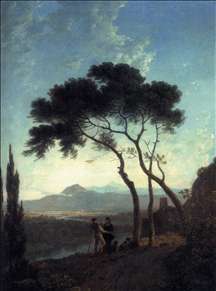 He produced not only large landscapes in the manner of Nicolas Poussin, Salvator Rosa, and Claude Lorrain but also numerous drawings of Roman sites and buildings, which he used in composing Italianate landscapes after his return to England. The finest of these is a set of drawings made for Lord Dartmouth and dated 1754. They show how Wilson tempered his delicate observation of light and distance with the discipline of such 17th-century classical Baroque painters as Poussin and Claude. Returning to London probably in 1757, he became influential as a teacher and, after 1760, as an exhibitor with the Society of Artists and the Royal Academy. He was a founding member of the academy in 1768 and, from 1776, its librarian, a post he took to relieve his poverty. Though continuing to produce Italian landscapes, Wilson now turned to depicting his own country, especially Wales and the rural environs of London. The order and clarity rather than the classical apparatus of Italy survive, and Wilson s exact and tranquil recording of clear or suffused air, distance, and varied lights predominates, as in his famed Snowdon. His landscapes of this period exerted considerable influence on J.M.W. Turner, John Constable, and John Crome. Wilson s later works, such as Minchenden House, tend to abandon formal composition, using tonal methods of recording space. Many works ascribed to him, especially late ones, are partly the work of his pupils. See more details about "The Vale of Narni"
See more details about "The Mawddach Valley and Cader Idris"